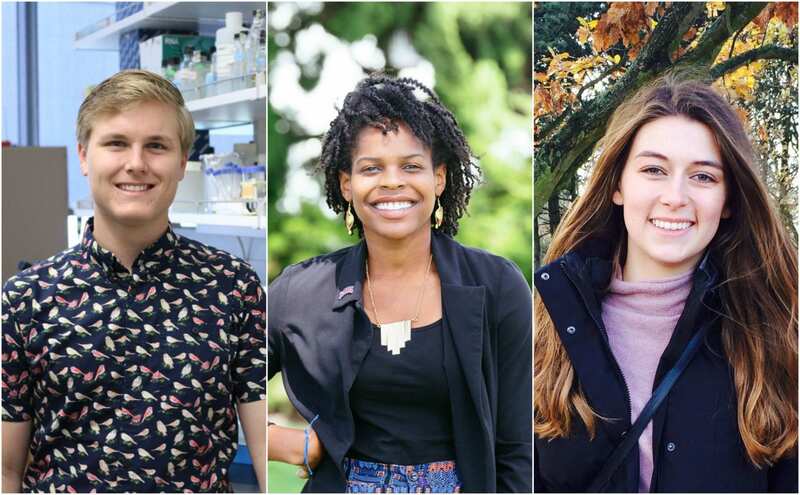 Three recent graduates from the Frank R. Seaver College of Science and Engineering at Loyola Marymount University can add Fulbright Scholar to their growing list of honors. Alex Napior, LaShyra Nolen and Olivia Schimmels will head to El Salvador, Spain and Poland, respectively, to teach English and conduct research during the next year. Fulbright winners are selected on the basis of academic and professional achievement, a record of service and demonstrated leadership in their respective fields. The Seaver three meet all that criteria and more. Alex Napior, who graduated in May with a degree in biology and Spanish, said valuable access to professors helped make him a competitive Fulbright candidate. “I built up a lot of confidence learning how to conduct research, work with professors and carry out projects outside of a classroom setting,”said the Sacramento native, who started working with professors his freshman year. Earlier this year, Napior, who is also part of the university’s Honor’s Program, won an award for “Best Poster in Genetics” for his research looking at plant-microbe interactions at the West Coast Biological Sciences Undergraduate Research Conference. His mentor was Nancy Fujishige, assistant professor of biology, with whom he has conducted molecular research over the past two years. LaShyra Nolen, student body president in 2016-2017 who graduated in May with a degree in health and human sciences, will teach English and work on public health initiatives in Galicia, a rural community in Spain’s northwest region. She attributes the ample opportunities she participated in at LMU as contributing to her competitiveness as a Fulbright applicant. “I had an amazing experience studying abroad in Madrid by junior year,” Nolen explains, adding that she taught an intermediate-level English class and was an English tutor in a homeless shelter. As a member of Belle’s Service Organization, she volunteered with Good Shepherd Shelter – a domestic-violence shelter in Los Angeles – since her freshman year. Through the Clinton Global Initiative University, Nolen was awarded funds to teach a weekly health and nutrition class at Good Shepherd. Olivia Schimmels, who graduated in May with a degree in mechanical engineering, had accepted a position as a product review engineer at Boeing when she learned of her Fulbright in June. She will work for Boeing for two months before taking a leave of absence and departing to Poznan University of Technology to teach STEM courses. Schimmels credits her bright future to relationships she developed and the range of opportunities available to her at LMU. She studied abroad in Germany her sophomore year and was treasurer for the LMU Chapter of the Society of Women Engineers. She was also a resident advisor for the Program for an Engineering Education Community, a living-learning community for first-year engineering students. Through those activities, Schimmels said she was able to pursue her desire to mentor younger students and help others.